HR tech and human touch are both important to recruiting. Home » Randstad Sourceright Insights » People Matters: HR tech and human touch are both important to recruiting. The point where HR technology and human interaction converge (and diverge) remains unique to each organization. Yet, a recent Talent Trends study by Randstad Sourceright, sees that employers around the globe have found some common ground. Most notably, 65% of 800 C-Suite and human capital leaders surveyed say that smart HR technologies — such as AI, automation and talent analytics — make it possible for recruiters to focus on knowledge-intensive tasks that add greater value. “Our global snapshot reveals that employers around the world are navigating which steps of the recruitment process favor the human touch and which can be automated to allow workers to focus on more strategic and value-added services,” says Michel Stokvis, managing director of the Talent Innovation Center at Randstad Sourceright. “Technology alone won’t give you an edge,” Stokvis continues. “How you use it to accelerate hiring outcomes and support the productivity of people will.” The majority (65%) of talent leaders surveyed agree, agreeing that the hiring experience will be enhanced by HR tech that enables greater recruiter-candidate interaction. 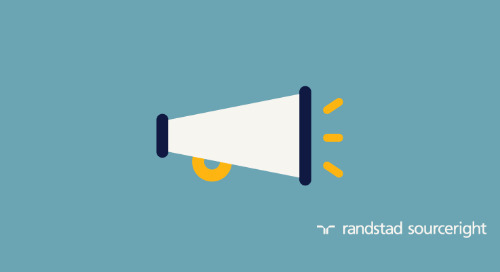 Additional findings are shared in the article on People Matters, including details on technology readiness and adoption based on Randstad Sourceright’s HR Tech Adoption and Readiness Indices. You can also learn more by requesting your copy of the Q3 2018 issue of Talent Trends Quarterly. Randstad in DJSI 2018 and assessed best on Labor Practice Indicators.